Our school follows The British Association of Teachers of Dancing (B.A.T.D) examination board. We usually hold between two and four sets of examinations each year. 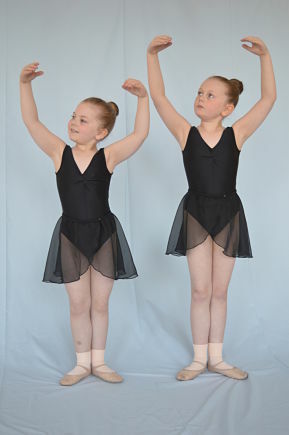 Examinations are taken in tap, modern dance, ballet, freestyle, acro-gymnastics and drama. We study for both amateur medal tests and grade examinations including professional teaching certificates. Many of our students are regularly selected to attend the B.A.T.D Scholarships and the school has been awarded a Certificate of Recognition as a School of High Standards by the International Dance Council. All of our teachers have studied at Heritage Dance Studio and gained professional qualifications with BATD. Our basic uniform is pale pink (pale blue or white for boys) and black. We follow a strict dress code for examinations as shown below. Children in reception up to class 2 wear pink leotard with skirt, pink ballet shoes and white tap shoes. From Class 3 onwards our uniform changes to black. All uniform and shoes are available from our shop "Pirouette" whch is situated inside each studio.